Clark signed my card in about a month c/o the San Francisco Giants - he might have been actually one of my first TTM attempts, though it was probably in the off-season after the Giants got to the World Series in 1989. 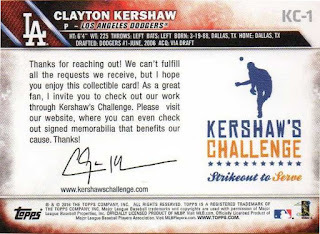 Since I just had no clue, I may have sent a superstar at the height of his popularity a request consisting of a couple of random cards with no self-addressed stamped envelope - needless to say, I don't really know what happened to that ancient attempt at a TTM. 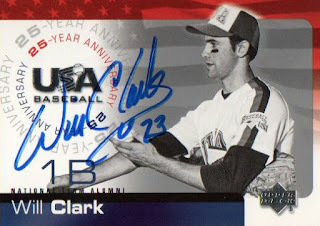 Up through last year, I don't think I've actually ever gotten an autograph from Clark either in-person or TTM - but he's been pretty consistent about answering requests sent to him in recent years, so I finally got in the action. "A favorite card from a country other than the United States." 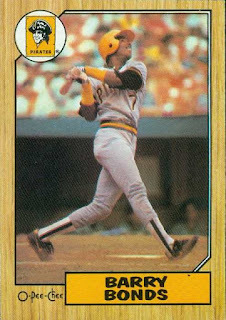 1987 O-Pee-Chee Barry Bonds #320 - I randomly bought two or three loose OPC packs at some mall show I stumbled upon when I was a kid and likely pulled the Bonds. 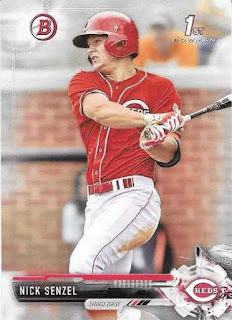 I don't think the card was worth anything more [maybe less] than the regular Topps card, since the OPC cards are sort of carbon copies of their Topps counterparts - looking at other Bonds cards from 1986/87, I've always liked the picture used by Topps, since it looks like an action shot where he might be following through on his swing. 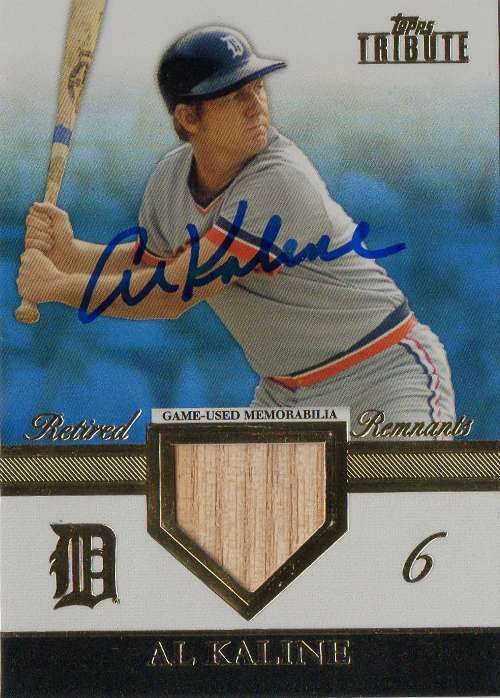 "A card of a player who became manager of your favorite team." 1993 Upper Deck Mike Scioscia #688 - this card is sort of unique because presumably the image used was from a spring training game, yet Scioscia didn't make the San Diego Padres' Opening Day roster in 1993. 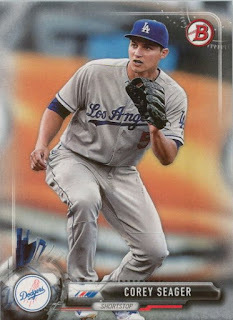 As a player, the longtime manager of the Angels probably shouldn't have been pictured in anything but a Los Angeles Dodgers uniform - though I guess 'transactions happen' when an old big league veteran has to try and latch on somewhere else. "A card from the first set you put together hand collated." 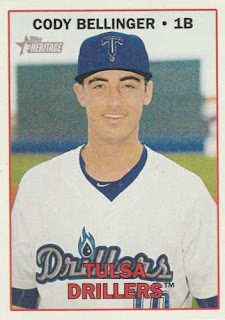 2016 Topps Heritage Minors Cody Bellinger #47 - this challenge reminds me of Day 3 and I had a hard time coming up with something since it really hasn't been a focus to complete a card set just for the sake of having all the cards in one hand. I do like to put together the minor league version of Topps Heritage - just to see which ones I can get inked up in-person or TTM. 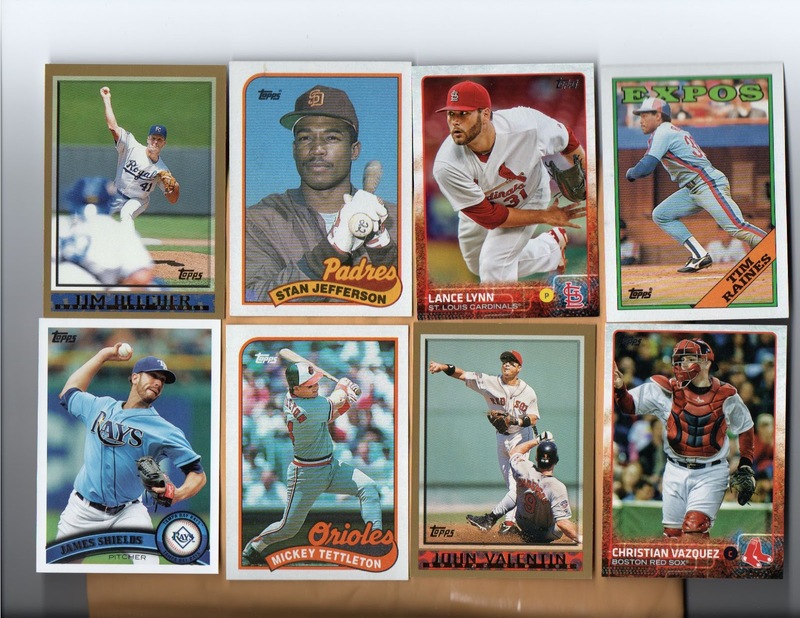 I'm pretty sure I've tried to buy a hand-collated set in recent years - but in 2016, the prices per unopened boxes seemed a little cheaper and out of the two boxes I purchased, I was able to build the 200-card basic set [minus the SPs]. 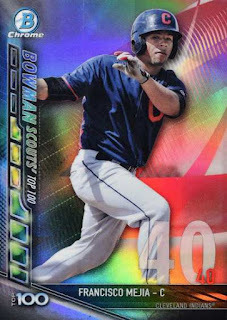 I was really looking for 2017 Bowman Mega Box [latest retail gimmick] - but they weren’t on the shelves at the Target I stopped at. 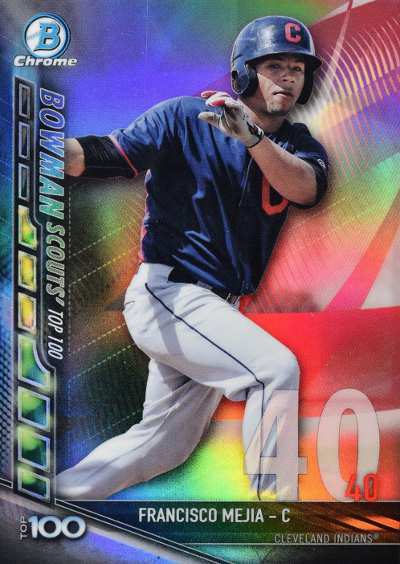 I was going to get a 24-card pack of 2017 Topps Bunt and a 30-card pack of 2017 Donruss - but this changed my mind on the Donruss and for $5 more, I impulsively grabbed one of these repack cubes instead. I saw these cubes on the shelves on a previous Target trip - I used to open these repacked boxes semi-regularly but I weaned off them because I figured I ran into my share of miscellaneous cards...maybe the repacks to get are the ones at Walgreens, though I don’t go there at all, so I haven’t really been tempted. I counted out 261 loose cards in the package - not including the ones in the two packs enclosed, which were a 2016 Topps Series I pack and a 2016 Topps Opening Day value pack. 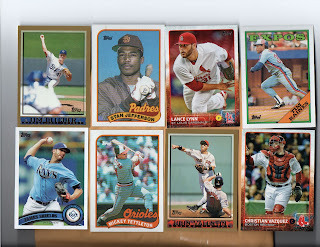 As far as content, I noticed a trend as far as how the repack was put together - you got your junk wax era cards [1986-1992], cards from recent years that might as well be junk wax and then miscellaneous cards. 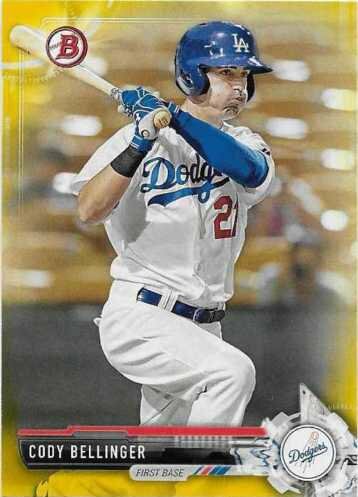 Your average 'star cards' probably don't mean as much in 2017 as they did 25-30 years ago - but there were some star power in the box, coming from the loose Topps factory team set cards broken down and inserted. 2015 Bowman retail paper autograph of Andrew Triggs [PA-AT] - the first card I stumbled upon was an autograph, though the bottom left and right corners card were dinged. 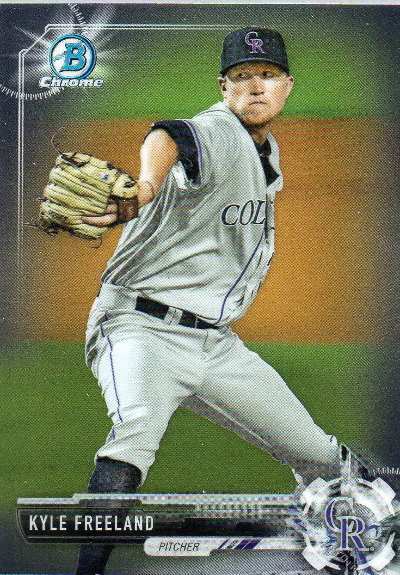 After bouncing around a couple of organizations, Triggs [I vaguely recall his name from reading USC Trojans baseball box scores] - has improbably pitched pretty good two months into the 2017 season. "A card of a player whom you appreciate but don't like." 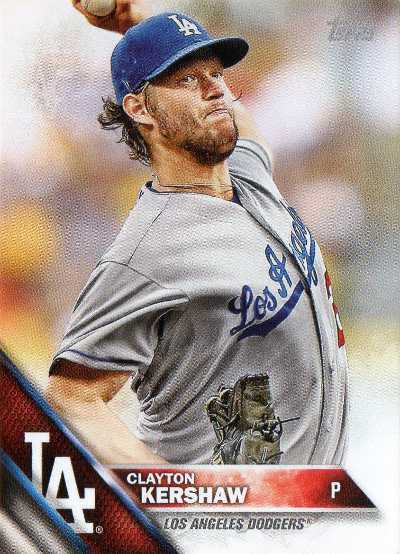 Kershaw lives a charmed life as the best pitcher in baseball, but aside from what he does in front of the cameras, I feel like he gives off a vibe where he's just too good for everyone - as is, Kershaw is such world beater on the field, it might be 'fun' to watch him deal with not being able to come through, to struggle and be human once in a while. "One of your favorite cards from the 2010s." 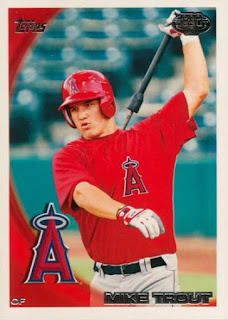 2010 Topps Pro Debut Mike Trout #181 - as an Angels fan, a favorite card from this decade needed to picture the best player in the game, six years running. "One of your favorite cards from the 2000s." 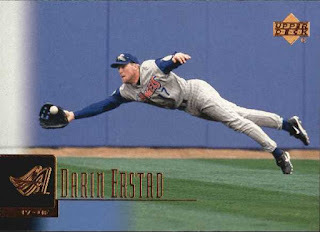 2001 Upper Deck Darin Erstad #46 - this was one of those cards that gave a snapshot of what a player was like. Erstad, the No. 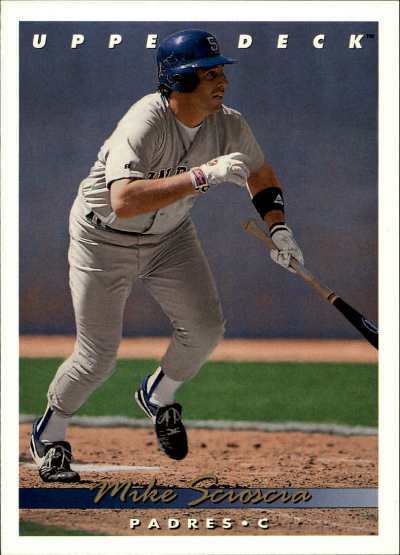 1 overall pick in 1995, had a reputation as a gamer - his batting stats weren't overwhelming except for 2000, where he racked up 240 hits and had a .355 batting average, but I always thought he was a tough out who grinded out at-bats. "One of your favorite cards from the 1990s." 1993 Upper Deck SP Ken Griffey Jr. #4 - the card holds some allure because it seemed natural to associate Griffey Jr. with the baseball card company that had a part in introducing the phenom to the hobby in 1989. 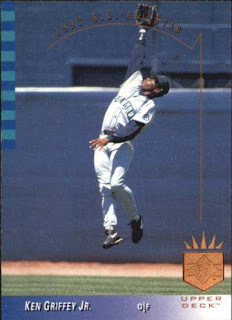 Because Griffey Jr. was one of UD's marquee athletes, I assume the company took more time in selecting an image that would pop - I do wonder how this image of Griffey Jr. leaping up in the air, trying to make an over the shoulder catch came to be. Because UD SP was such a high-end product, it wasn't like I was able to go into a Target or Toys "R" Us and pick up loose packs - I want to say I finally picked up the Griffey Jr. years after the card came out, though I'd have to check where it is. Carpenter signed my cards in about two weeks c/o the high school he teaches at in Georgia - because he played in the junk wax era, I was superficially aware of him as a relief pitcher who spent most of his 8-year big league career with the St. Louis Cardinals. 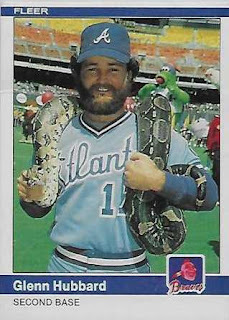 "One of your favorite cards from the 1980s." 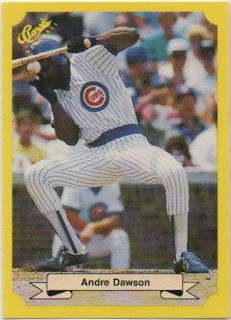 1987 Classic Update Yellow Travel Edition Andre Dawson #124 - I like how the intense, scary image of Dawson beaned by a baseball was re-used from a Sports Illustrated cover the same year the card was printed. 1989 Donruss Ken Griffey Jr. #33 - for me, this rookie card likely the spurred me to chase the hot rookies because of their perceived value, according to what some price guide listed; even though it wasn't really the Griffey Jr. rookie card to have, it was the first one I had access to. 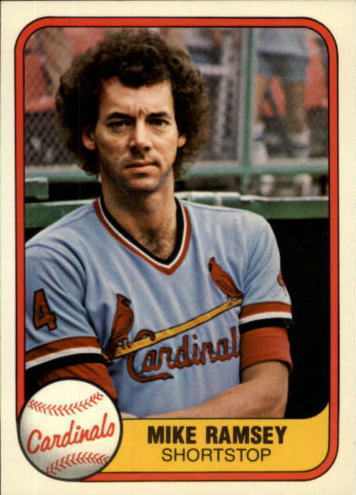 1987 Donruss Will Clark #66 - I love the confident smile Clark has on this card. 1987 Donruss Greg Maddux #36 - in addition to capturing an image of a youthful Maddux, the subtle colors coming together between the uniform colors and the card's design, makes this junk wax era rookie quite nice. 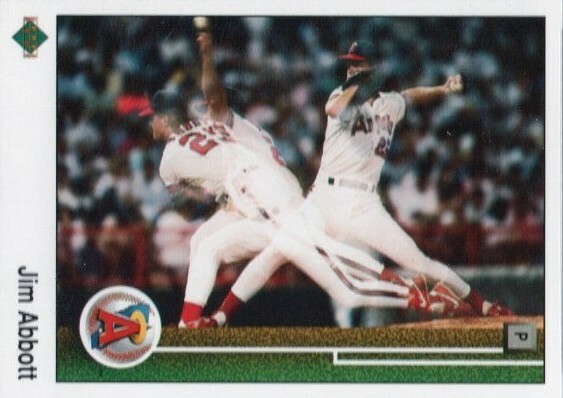 1989 Upper Deck Jim Abbott #755 - looking back, there was something about Abbott being a rookie phenom [born without a right hand, jumped to the major leagues without playing in the minors] and the multiple exposure effect UD used, to make this card pop. 1984 Fleer Glenn Hubbard #182 - the boa constrictor card. 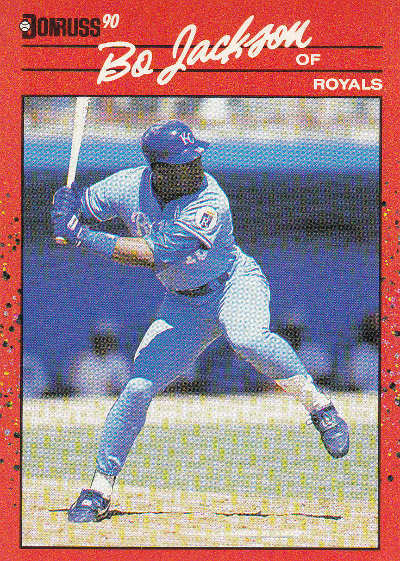 1989 Upper Deck Ken Griffey Jr. #1 - has to be on everyone's list. 1989 Fleer Billy Ripken #616 - FF error - is this the most infamous baseball card over the past 25-30 years? 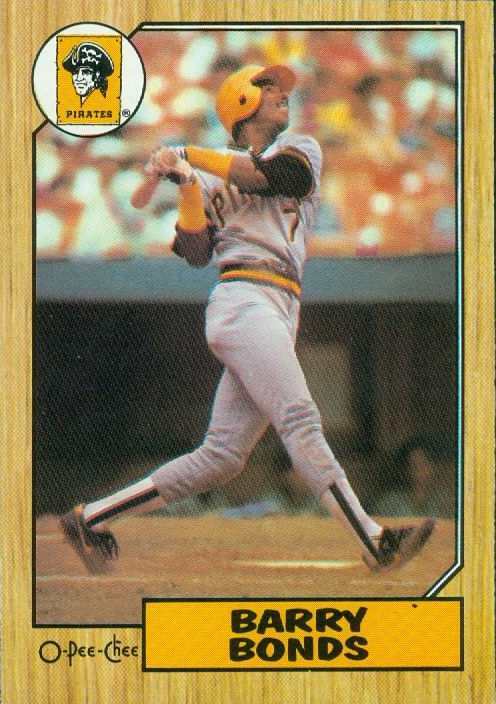 1981 Fleer Mike Ramsey #549 - ? "One of your favorite cards from the 1970s." 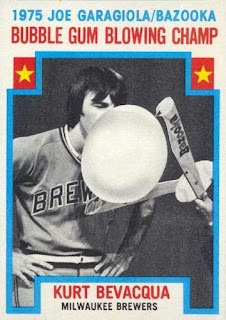 Without thinking too hard about it, I'd probably go with Kurt Bevacqua's 1976 Topps #564 Bubble Gum Blowing Champ card - I like it because it's an odd, quirky card from a flagship set. As far as how the card came to be, The Fleer Sticker Project blog has done research in providing the context behind the card - featuring screen shots and footage from the actual event imbedded from YouTube. 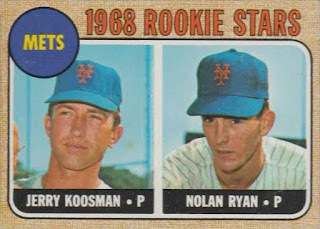 "One of your favorite cards from the 1960s." 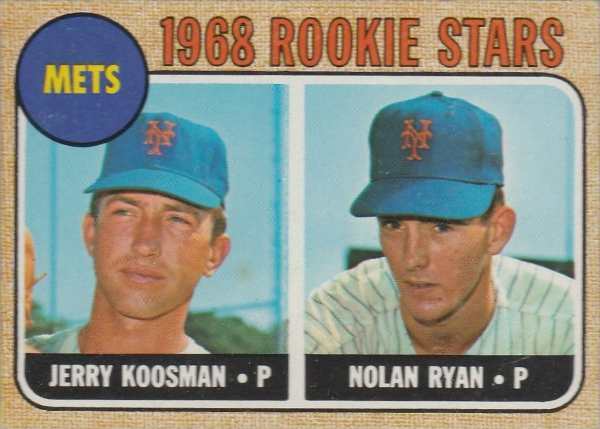 1967 Topps Nolan Ryan / Jerry Koosman #177 rookie card - I chose this card because it's the key mainstream card of a dominant strikeout pitcher who I felt peaked as a national superstar in the early 1990s. 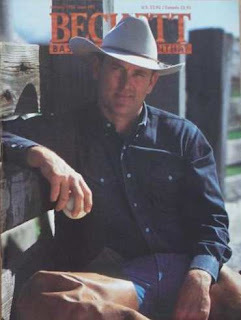 For a period of time in the early 1990s, Ryan was everywhere and I still remember him decked out in his ranching / cowboy gear - on the front cover of this Beckett Baseball Card Monthly magazine. Ryan's rookie card was a real big deal among collectors, whether or not it was realistic to own - it gained some notoriety when it was it accidentally sold at a card shop for $12. 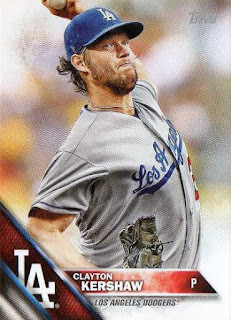 I thought pulling any of Ryan's cards were worth its weight gold and even though he was in his 40s and really on his last legs of his distinguished big league career - the following highlights would have led anyone to believe the all-time strikeout king was simply ageless. "One of your favorite cards from the 1950s." 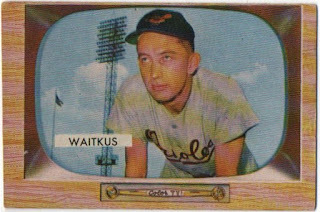 1955 Bowman Eddie Waitkus #4 - I was thrilled when I found a copy of this card at my LCS back in 2015. 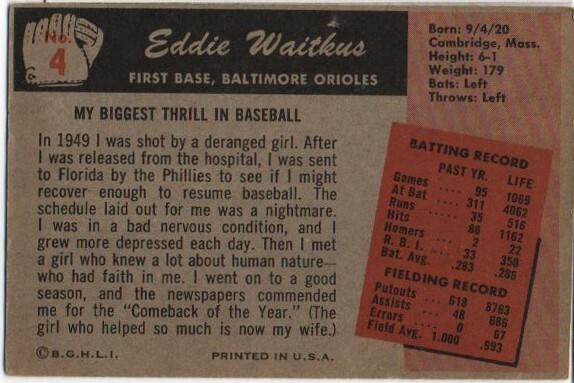 The write up on the back of the card spells out Waitkus' comeback - after being shot by an apparent stalker. "A card that reminds you of a family member." Baseball card collecting has been a self-absorbed hobby for me, where I don't know if any particular card reminds me of a family member - I'm not so sure about the details now, but 1990 Donruss reminds me of my mother and the first time, I got my first full box of cards. I think my parents were in line at a Costco, before it was a Costco warehouse club store and I just came up to them, wailing and pleading for this random box of cards - I remember my mother being so mad at me that she wanted to slap the box out of my hands. However, I caught her in a bad spot in public and she couldn't do anything to keep me from calming down - I think she was angry because she's the rational person to rein in the spending in my family and I'd challenged her authority, where now she had to go plunk an extra $10-$11 on a box of cards [I don't think she even had a concept of trading cards at the time] just to shut me up. I ended up with the box of cards, all 36 packs of them to rip and to flip through - though the cards are long gone, to this day, I can still imagine the wrath of my mother. The 82-year old Kaline signed my cards in blue Sharpie in 10 days - he is a fairly consistent TTM signer, even though I've read he can be grumpy in person and at times signs a sloppier 'Angry Al' version of his autograph. 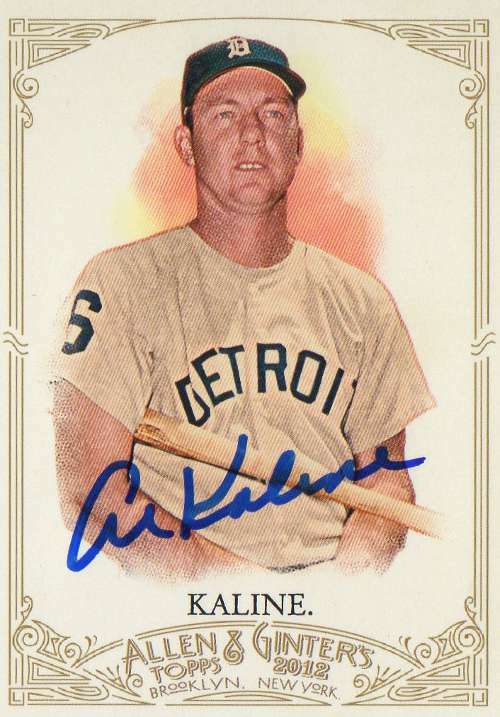 I've been holding off on sending to him, but he isn't getting any younger, so I finally scrounged up a TTM request - with the appropriate amount of cash money for Kaline to sign three of his Topps Allen and Ginter cards and a relic card I pulled out of a $50 pack of cards. 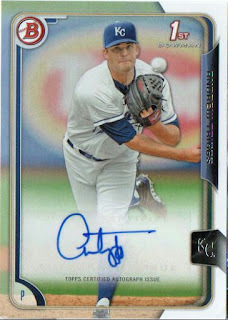 Because the card had a shiny, glossy surface, I wanted to prep the card with more effort - trying to make it so an autograph has less of a chance of getting smeared or streaked, especially when I'm trying to get the card signed randomly TTM as opposed to an organized signing. Relic cards are usually thicker and I didn't want to take a chance that the card would get wrecked using a regular envelope - to help insulate the thicker card in the 6x9 manila SASE envelope I enclosed with my request, I cut up a piece of a bubble mailer used as a 'holder' when my cards were sent back to me. 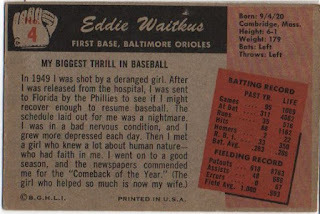 "A card you bought in person and the story behind it." 1977 Topps Tony Armas / Steve Kemp / Lopez / Woods RC #493 - a copy of this card may have been the first I've sought out to purchase at a card shop. 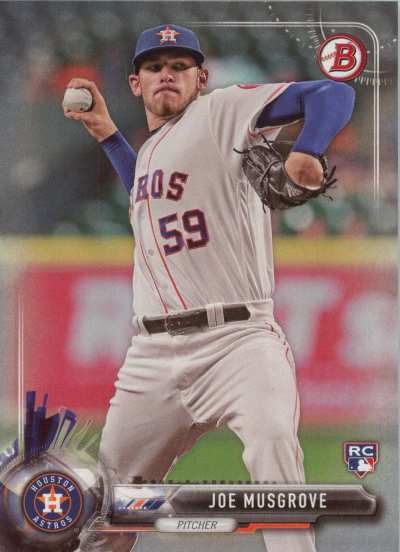 When I started getting interested in collecting baseball cards, I'd look up books in library - one book I stumbled upon mentioned something about collectors saying that the Armas rookie card had good potential. 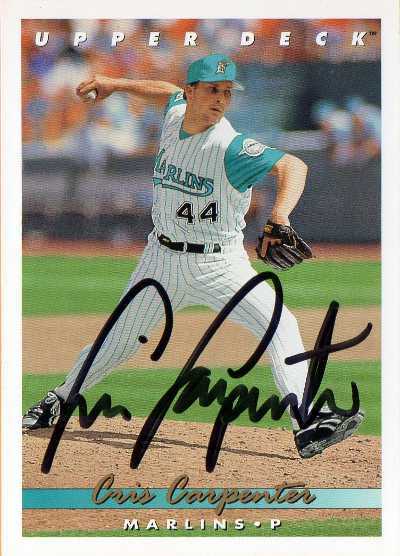 At some point, I managed to get to a baseball card shop and said I wanted an Armas - I don't know if I was amazed, but I might have thought it was neat where the person I was talking to might have gone to the store's storage room and came back with the card I'd asked for. 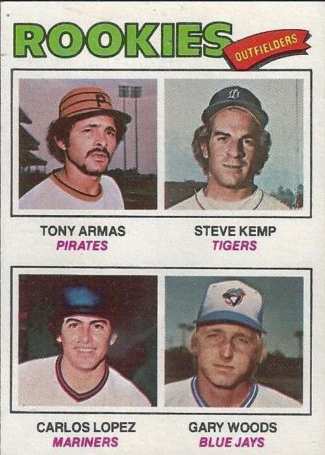 I think he looked in a price guide and let me have the card for about a dollar - I didn't know what I did with the card after the fact, it was probably thrown away at some point, though I got another years later and sent it to Kemp for a through the mail autograph. Looking back, the book I read was printed in 1983 and by the time I got the investment tip - the playing careers of the guys pictured had played out. "A card you spent more than $10 to get." 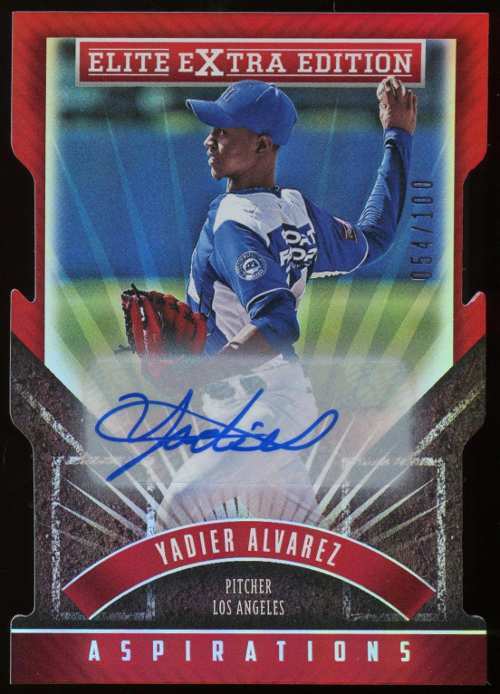 2015 Panini Elite Extra Edition Yadier Alvarez #/100 die-cut auto [$14.99 BIN plus $2.95 s/h] - I picked this certified autograph card up from eBay since the Los Angeles Dodgers pitching prospect is a flamethrower with ace potential, ranked No. 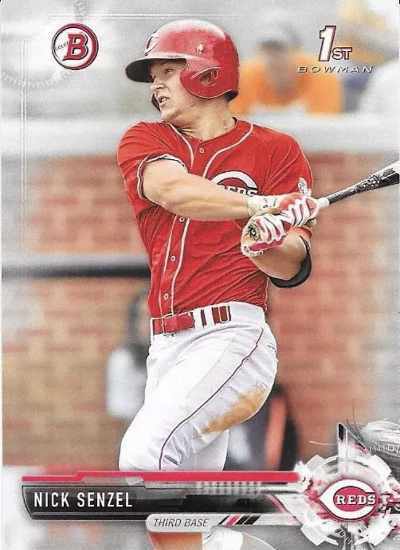 26 among Baseball America's Top 100 prospects and No. 43 among Major League Baseball's Top 100 prospects. In a minor league game I saw this spring, he sent one guy’s bat flying over the visiting dugout on the third base side - that may not mean anything, but that’s kind of the stuff he has. Once in a while I still want to impulsively grab first-year certified autograph cards of random prospects - frankly I'm just not going to get into the Bowman Chrome autos and corresponding parallels, but maybe a card from a lower-end prospect product catches my attention. In 4 starts with Rancho Cucamonga Cucamonga Quakes, he's been battered around with an ERA of 6.43 - he hasn't shown much yet, but he's actually whittled his ERA down and once he figures things out in a hitter's league, who knows how well he'll end up doing. 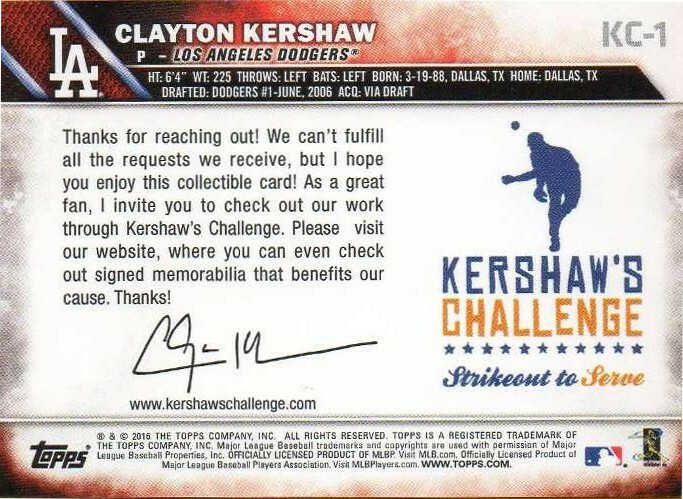 "A certified autograph card of one of your favorite players." It's not a pack pulled autograph, but it is certified and slabbed by PSA/DNA, so after scratching my head to come up with a card to post - I've settled on this 1996 Score Zenith Kirby Puckett #149 signed through the mail just about 20 years ago. 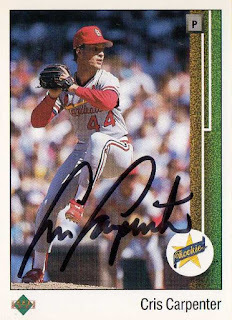 Puckett was one of the larger than life baseball stars from the mid 1980s through the mid 1990s - his cards came out through the height of the junk wax era, so it was easy enough to end up with his cards, even if they were your typical Topps, Donruss, Fleer, Score, Fleer Ultra, Leaf, Pinnacle, Pinnacle Select, Upper Deck, etc. I think the fact that I occasionally ended up with his cards, in addition to helping the Minnesota Twins win a World Series championship in 1991 - made Puckett a pretty familiar national star, even if he didn't star for my hometown team. He had a well earned reputation of a guy who did so much on the field to help his teams win and help the community off it - unfortunately his playing career ended when he was still surging strong in his 30s and post-career, his sterling reputation took a drastic hit. 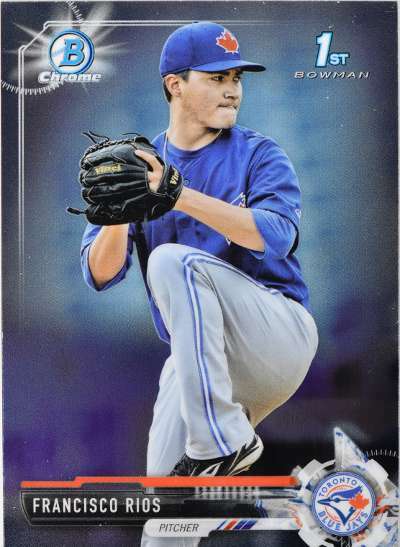 The basic cards maybe an afterthough, but they are nice - it may not be a thing Topps is actually going for, but I like the idea that Bowman looks a little different, with a focus towards the future, rather than being conservative and boring. The basic cards have full bleed, almost Stadium Club lite images - even if the action is focused strictly on the field as opposed to the unique shots found in TSC.